Samsung HT-BD1250R review | What Hi-Fi? There's a key difference between this package and some of its closest peers. 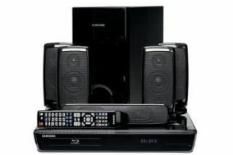 This Samsung system uses four standmount-style, compact satellites (alongside a hefty subwoofer and conversely, a particularly slim and wand-like centre channel). There are intrinsic advantages to a package like this: if you're pushed for space it's easier to accommodate and four identical satellites should aid cohesion, but by the same token we wouldn't expect the same dynamic power or scale as floorstanders. Certainly the main receiver unit seems to fit the bill. 1080p/24fps video can be displayed no problem, and there's HD audio, too. There's an FM receiver and an iPod dock – though the latter has to be connected to the back of the unit. There's an Ethernet port for a wired internet connection or you can add the optional wireless dongle. There's a USB input, too. The welcome addition of a built-in test tone is tempered by the inability to adjust speaker levels at the same time. Once we get this sorted we put on the Gladiator Blu-ray. where it becomes clear that this Samsung lacks a little sonic muscle. That centre channel sounds as weedy as it looks, while the satellites also lack much involvement anywhere near the bottom end of the frequency range, relying on the subwoofer more than they should to provide some solidity. However, as Dead Snow illustrates nicely, there's a smooth handover between sub and satellites, while the four speakers do a good job of delivering a cohesive surround sound ‘whole', with atmospheric sweeps and slashing knives successfully and speedily swishing around the room. Visually, the Samsung's not too happy dealing with deep, dark black levels – it struggles to discern differences and details in blocks of dark colour. DVD content especially displays some noise, while lacking the insight and sharpness of the best. This is illustrated by the vast landscape shots in No Country For Old Men. For the technical specification this Samsung represents decent value – there's a lot here for relatively little outlay – and it's compact for a small room. But £450 is £450, and when it comes to performance per pound we think you would be best saving for something a little more capable.